Trend Move on Nifty Setting Up, Which Way? You are here: Home / Futures and Options / Trend Move on Nifty Setting Up, Which Way? Last few weeks nifty just grinding gives sudden jerk moves where many traders cannot claim full profits neither small loss. So are we nearing an end to this chop move ? Yes says market profile. I took a composite profile of certain period to get clue for further auction and completion of present auction. 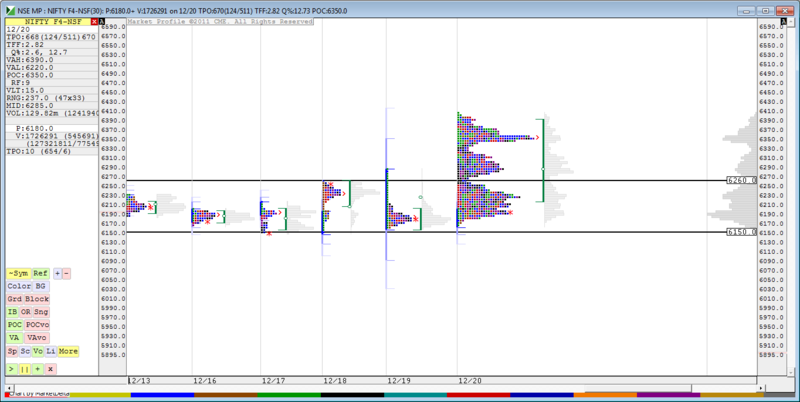 On composite profile, value area clearly developed upside yet the attempted price direction on last few profiles was on downside. The present composite profile development suggest a limited downside and good upside till 6350 / 6400 holding 6150 mark. 6260 level might act as mild resistance if market expects more clues where it might lead few more rotations here in the same zone, personally not expecting the same. so the clue I get from the above readings Any shorts should trail above 6260 booking major profits here and new low risk longs can be added here with stop below 6150 looking for 6350 / 6400. Any break below 6150 will start a new down leg going forward. Personally Positioning for Long side with least risk. That is a not a trade recommendation. Just looking at how context is shaping up. -Don’t be biased, trade what market shows. Respect SL.